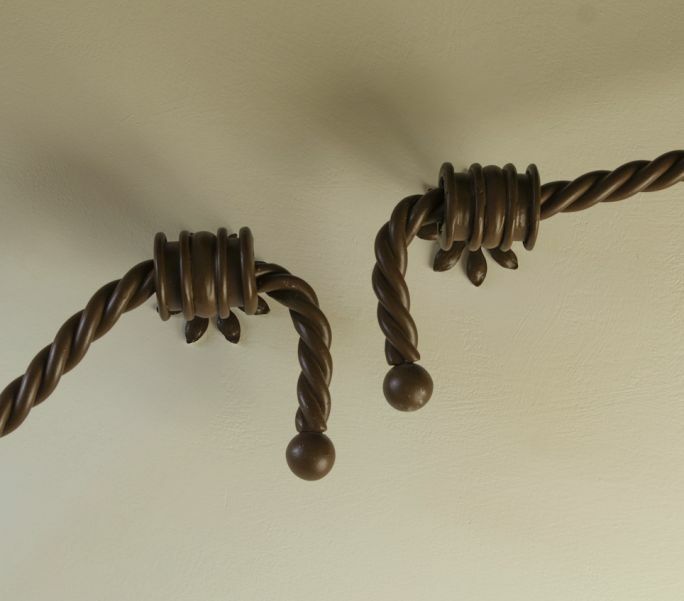 Entirely handmade, twisting Iron in order to form a rope Handrail, with Wall's sleeves of 5cm diameter, 1 per meter. Mono-colour varnished with industrial Paint (it is possible to choose the colour). This Object is useful and resistant at the same time, a Handrail for the Stairs of Your House and a wonderful interior design slice as well. Its well-refined Aspect makes the wrought Iron appears like a light and sinuous Rope, with the colour that best suites Your Flat. In Your Order, within “Notes”, please specify the lenght of each Piece in case lower than 1 meter and how many interruptions or consecutive Waves You prefere, in case the Lenght is higher than 1 meter. With this kind of Manifacturing it is possible to realize custom-cut Lamps, Beds and Tables on request. DIMENSIONS: minimum length per item 30cm, max 1 meter. WEIGHT: 2 kg per meter.